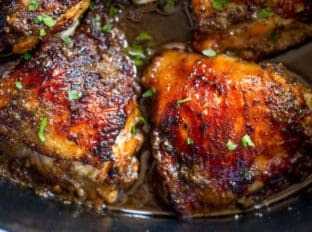 Slow Cooker Jerk Chicken is actually a take on my classic Jerk Chicken recipe that I used to roast for clients (I would spatchcock the chicken and rub the mixture into it and roast it in a cast iron skillet for basically the best roast chicken ever!) but adjusted for the fact that I never have time or patience to keep my eye on the oven now that life is basically a circus. The herbs and onions in the marinade for this Slow Cooker Jerk Chicken is about as delicious and authentic as I’ve had. I de-seed and de-vein the jalapeno before using it but when I know I don’t have to share with a spice-wimp I double the jalapeno and leave the ribs in. The added heat makes it an even more authentic version with the extra spicy kick. 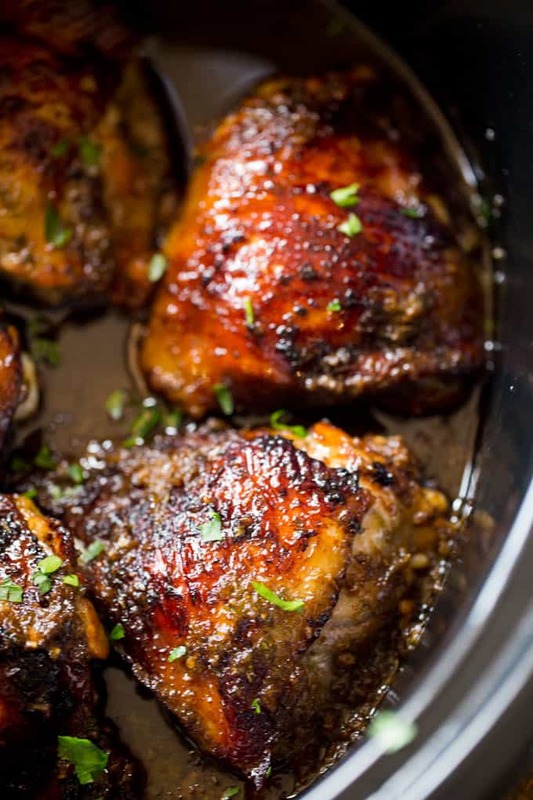 Plus since you’re using the slow cooker all that delicious heat mellows out a bit and melts into the chicken thighs which are going to be super moist and perfect for enjoying over a bowl of steamed rice or fried plaintains and a delicious Red Stripe beer. My New Slow Cooker: This recipe was made in this slow cooker. I browned the chicken in the cast aluminum insert before cooking the chicken on low, so I didn’t have a second pan to clean. For larger roasts I also brown the meat in the insert and not lose a bunch of the flavor by transferring the meat and leaving the browned bits behind. If you’re thinking of a new slow cooker, consider it if your budget is open. Add the chicken thighs to a large skillet and brown them on medium high heat on both sides for 3-5 minutes. In a food processor add the green onions, onion, jalapeno, soy sauce, vinegar, vegetable oil, brown sugar, thyme, cloves, nutmeg and allspice and puree until smooth. 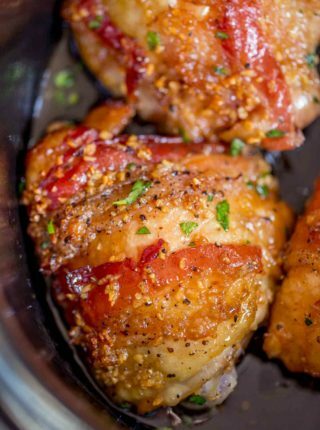 Add the chicken to the slow cooker skin side up and pour the sauce over the chicken. I live in a nyc apartment. I don’t have a grille, illegal, or slow cooker – limited space. Can i use the cast iron pan & lid or dutch oven? If so, on the stove or oven? 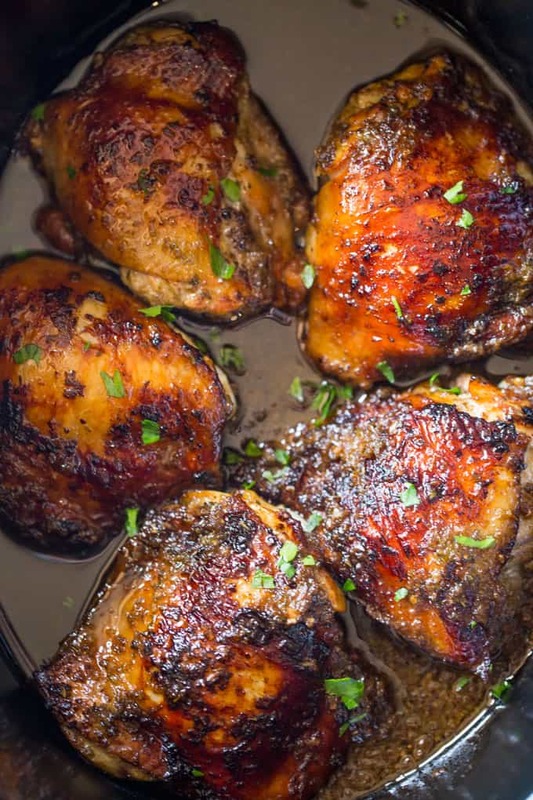 You can use the Easy Grilled Jerk Chicken recipe with a cast iron pan inside of your apartment with no issue. Enjoy! Sooooo excited about this recipe!! It’s cooking now and smelling so good in the house!!! 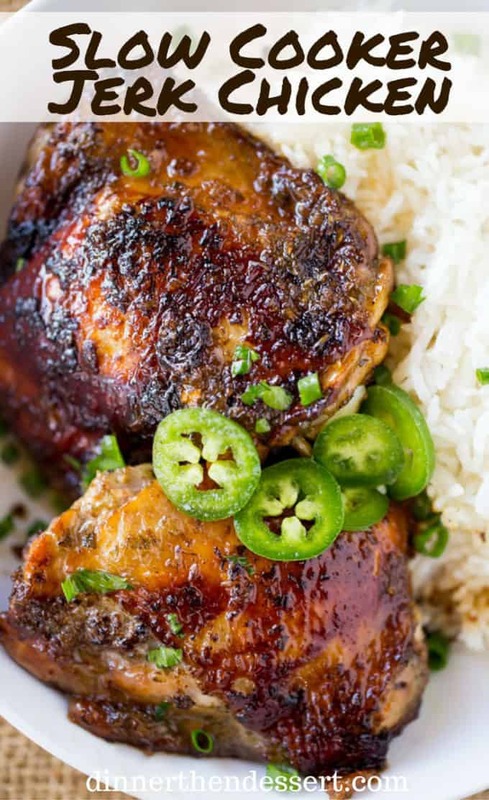 Quick question – I have never had jerk chicken that wasn’t spicy. Is this recipe supposed to be a more mild version? It hit me (when I sampled lol) that it’s not really as spicy as I thought it might be. Just asking so maybe I can adjust heat next time!! Thank you for a great recipe – I’m taking this to a cultural event this afternoon!! This is a more middle of the road version because I’m tring to make it to please as many as possible but feel free to adjust the seasoning to make it spicier. So glad you love the recipe! Could this work on high for 4 hours? I want to cook it at my work for my coworkers but only have a 4 hour window. I prefer low and slow but you could cook on high for 3-4 hours. I hope everyone enjoys it! Great flavor! I didn’t have allspice so I added a pinch more of cinnamon, nutmeg and cloves. I also added some fresh pineapple to the sauce before I blended the ingredients. I removed the chicken quarters out of the crockpot after 8 hours and they were fall off the bone tender. I wanted the ski crisp so I put them under the broiler in my cast iron skillet for a few minutes to make the skin extra crispy, yum! I also sautéed spinach, onions and pineapple together to add on top. A great recipe that doesn’t need exact precision to be an amazing meal! Your review is making me hungry, haha! So glad you enjoyed it, Katie! I have made this recipe 4 times so far & it’s one of my favorites. I make it with chicken thighs without skin or bone. I have an old time crock pot which means the chicken doesn’t get crispy, instead it falls off the bone tender which I serve over rice. Love the flavor of this recipe. So glad it’s one of your favorites! Thanks for the 5 stars. 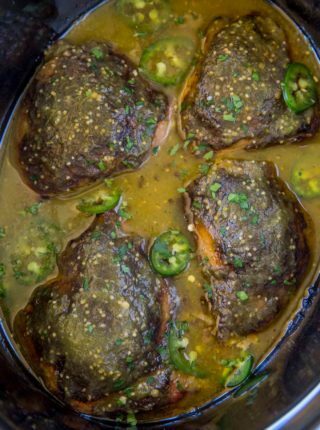 Can i used smoked paprika and cayenne instead of jalapenos? It will change the flavor but if you love those substitutions, feel free to use those instead. 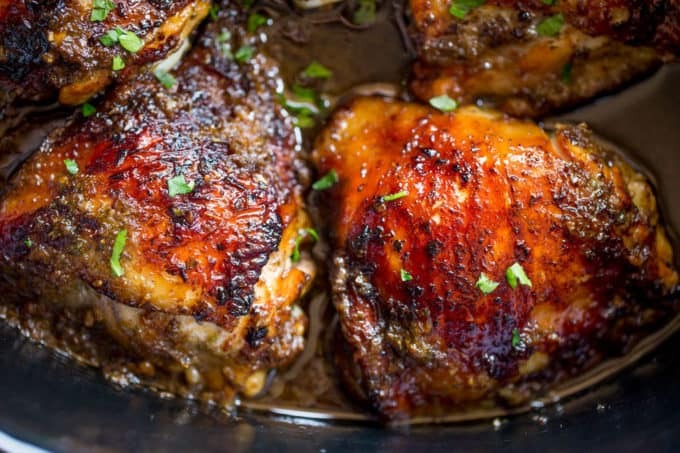 Can the slow cooker jerk chicken recipe be cooked on high for 4 hours instead of low for 8 hours? Made this with my Fiancee last week and we LOVED it. 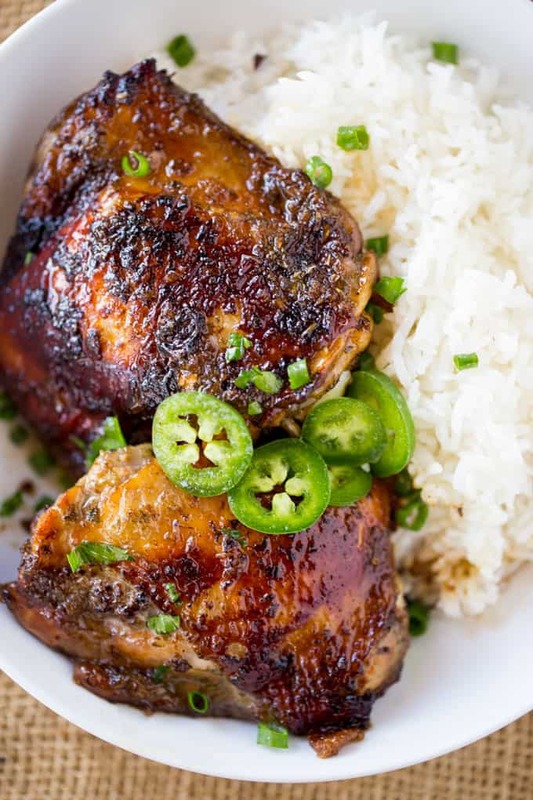 I’ve never had Jamaican jerk chicken before and now it shot up to the top of our slow cooker recipes. I am planning on going over my parents tonight and cooking it for them overnight in the cooker. I was wondering if I wanted to reduce the sodium a bit but still retain the flavor…should I reduce the soy sauce or just get reduced sodium soy sauce? Otherwise wouldn’t change a thing. I would use reduced sodium soy sauce. So glad you’re loving the dish! I had an issue with this. The flavor in this was great! I noticed this create A LOT of liquid, and I believe I read somewhere that this had to have minimal liquid? How can I avoid this? 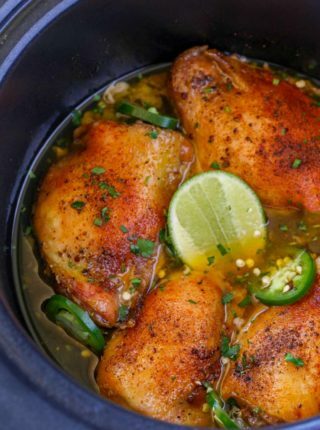 Be sure that your chicken is fully thawed before placing them in the slow cooker. You might even want to pat them down with a paper towel to ensure all liquid is removed. This should help with the liquid issue for next time. Do you think I could make the marinade, toss with chicken and freeze? Then take out, thaw and cook in crock pot? It’ll have a more liquid from thawing so it might not be as crisp in the slow cooker. If you have that issue, just place them under the broiler in your oven for a bit at the end. I’d love to know how it turns out for you. 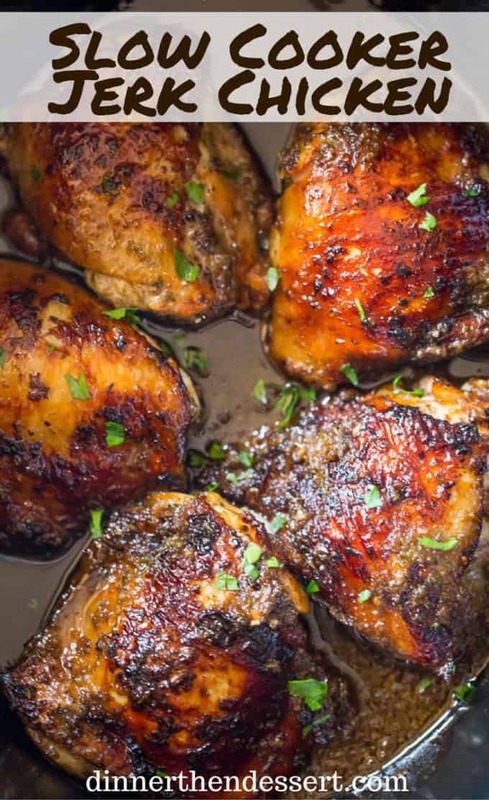 Do you have an Instant Pot version of the Slow Cooker Jerk Chicken? Or can you suggest how to convert recipes from “Slow Cooker” to “Instant Pot” ? I’m sorry but I know nothing about the Instant Pot. I’m sure you might be able to find a recipe online with similar ingredients to follow. The 8 hours on low in a crock pot is equivalent to about 25-30 minutes in the instant pot. We made this with bone-in skin on thighs the first time and they turned out great! However, my husband is trying to convince me to use boneless skinless and I’m worried it won’t be the same! Should I adjust cooking time? I wouldn’t recommend using it because bone in skin on thighs have a higher fat content and skin to protect it from drying out where boneless skinless do not. If you decide to try, you might need to cut timing back by an hour depending on how hot your slow cooker runs. P.S. Try and talk him out of it, lol! Hi, did you use fresh or dry thyme? I’ve used both but prefer fresh. Hi, we are a white meat/dark meat family. Is there a way that I can make this using both thighs and breasts without drying out the breasts? Also, I feel like I should be adding fresh garlic, or would that be too much. I would suggest wrapping the breasts in bacon to help keep them moist during the cooking process. As far as adding garlic, I say go for it. I hope you enjoy it! I was wondering, when say 3 green onions, do you mean 3 individual pieces or 3 whole bunches ? 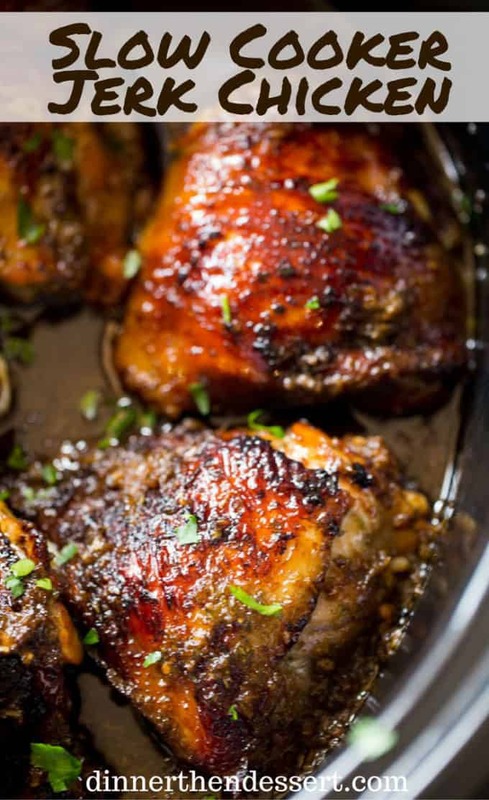 Do you brown the thighs 3-5 mins per side or 3-5 mins total before slow cooking? Don’t want to overcook, but also want to get some crsipiness. I’m curious, what is the consistency of your puréed ingredients? Mine comes out watery and grainy (probably cause of the onions, jalapeño). It cooks up fine, but just wondering if maybe my food processor isn’t that great. I process for a long time, too. It just doesn’t come together as a thick sauce. That sounds right. It’s not going to be a cohesive sauce but just make sure it’s all mixed up. Glad you’re enjoying it! This is easy to make and so delicious! First I like to say thank you for sharing this wonderful. I have made this recipe twice in my crockpot. I would have to say the second time around was the best because after cooking I allowed the chicken to marinade inside the juices within the crockpot. I served with basmati rice and avocados. AMAZING! Hello, would chicken breasts work here? I usually don’t recommend putting breasts in the slow cooker for fear that they’ll dry out during the cooking process. I’ve made this recipe 3 times for different family members and everyone LOVES it. 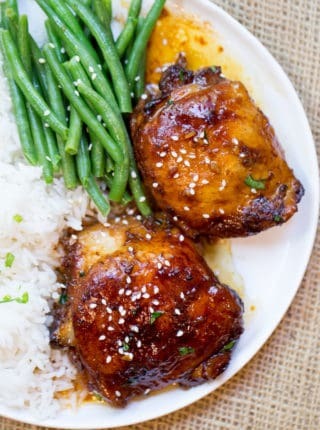 Chicken is tender and falls off the bone and the flavours are perfect! I’ve made it on high in the slow cooker for 4.5 hrs and on low for 8 hrs. Turned out great both times. Thank you! EXCELLENT DISH! I followed your recipe exactly as you stated and it is delicious!!! Are your spice amounts for fresh or dried herbs? Will the cooking time change if I use breasts? I don’t recommend using breasts in the slow cooker becuase they don’t have the same fat content to render down and keep the chicken moist. I know someone commented above saying that their breasts turned out tender so you could definitley try it. Did you serve this with rice or plantains? I served it with rice but plantains sounds like a perfect accompaniment as well! I made this last week cook it on high for 4 hours couldn’t wait to eat it. Have left over next day. The left over were much better the flower all soak Into the chicken already. Making it again today start early today so I will have flavorfull jerk chicken tonight. The meal was a hit in our family. how many thighs did you use? I’m hoping to put it on for 4 hours on high, as I don’t realistically have 8hours when I finish work. it’s my first ever time using my slow cooker and I’m abit apprehensive ? Made this and hubby loved it. I did place in oven at end to help crisp the top. Well be making it again, might try wings too! I made this this eve, however when I wen5 to it after 5 hrs, the base had become dry and I could smell a bit of a burn smell. I have added water and the marinade mixed in with the water and looks quite thick. I love the smell and can’t wait to try it but have I maybe made a mistake in cooking? Oh no! sounds like you slow cooker might run a bit hotter than mine. Glad you were able to save it though. Cook on low for 6-7 hours. Enjoy! Very flavorful! I used a whole jalepeno, seeds and all, perfect heat. Paired nicely with Caribbean Rice. So glad you enjoyed it Taryne! Made this is the oven the other night for dinner. I thought it was delicious!!! My husband and son, not so much. 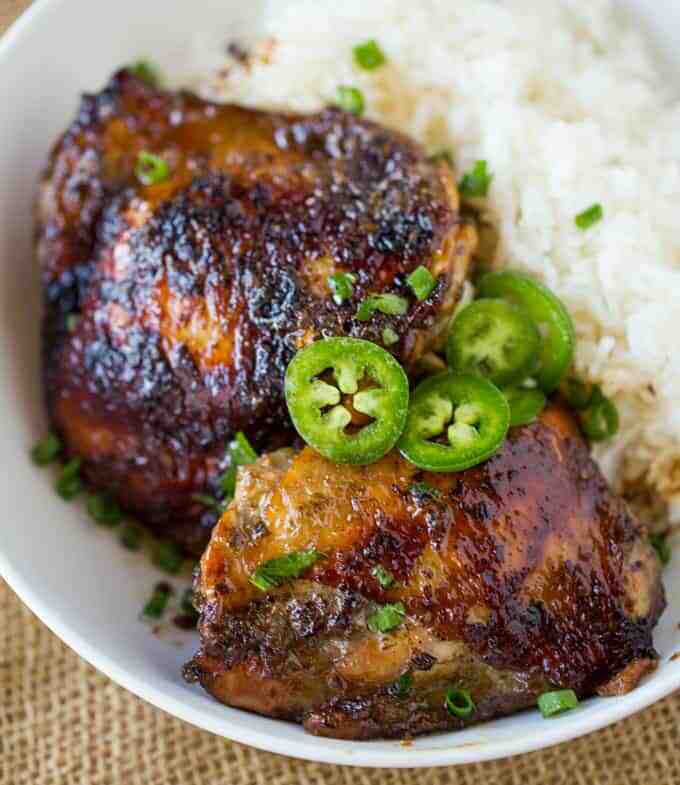 :(If you like jerk chicken this recipe is pretty good and easy to make. I definitely recommend it! I’m glad you were able to adjust it to your liking. 🙂 Thanks for coming back to let me know how much you all enjoyed it!